Meetings are from 7 to 9pm. After a brief business meeting to discuss the 2017-2018 officers and programs, all are invited to show and share about your favorite new (or vintage) project. Share what inspired you to make it, how the finished project matched your vision (or not! ), and any tips you learned. After this meeting, we will take a break for the summer, so please come and be a part of this fun evening! Leslee Fiorella is a weaver and textile designer. She developed her modern design sensibility working for iconic companies Knoll and Maharam at the start of her career. After working in New York City for many years in the textile industry, she began to miss her connection with the loom. She made a coastal shift to California and returned to what she considers the core of her creative soul…handweaving. Leslee is also co-owner of Folk Modern Craft and the modern craft store, Cast Away & Folk, in Santa Rosa, CA where she heads the weaving department. She lives in Sonoma County, with her husband and two children. You can follow Leslee and her work at slowandwoven.com. Toni will share the progression of her weaving, from her beginning weaving class with Lou Grantham through Jason Collingwood, Debra Corsini, and many others. She will bring many samples of her work. Youngmin Lee is a textile artist living in the San Francisco Bay Area. With a BA in Clothing and Textile and an MFA in Fashion Design, Youngmin has presented workshops on Korean Textile Arts including Bojagi workshops at the Asian Art Museum, Oakland Museum, Richmond Art Center, Mendocino Art Center, LACMA, Society for Contemporary Craft in Pittsburgh PA and numerous textile guilds. In addition to teaching in person, Youngmin created the DVD Bojagi: The Art of Wrapping Cloths to reach people from afar. She is organizing the Korean Textile Tour in October 2017 with Mirka Knaster and Lissa Miner. She also is involved in bringing contemporary Korean fiber artworks to introduce in U.S.
Youngmin’s bojagi works were shown in the U.S. including Asian Art Museum in San Francisco, Muckenthaler Center in Fullerton, Mendocino Art Center and internationally such as Korea Bojagi Forum exhibits in Jeju and Seoul in Korea and Romania. 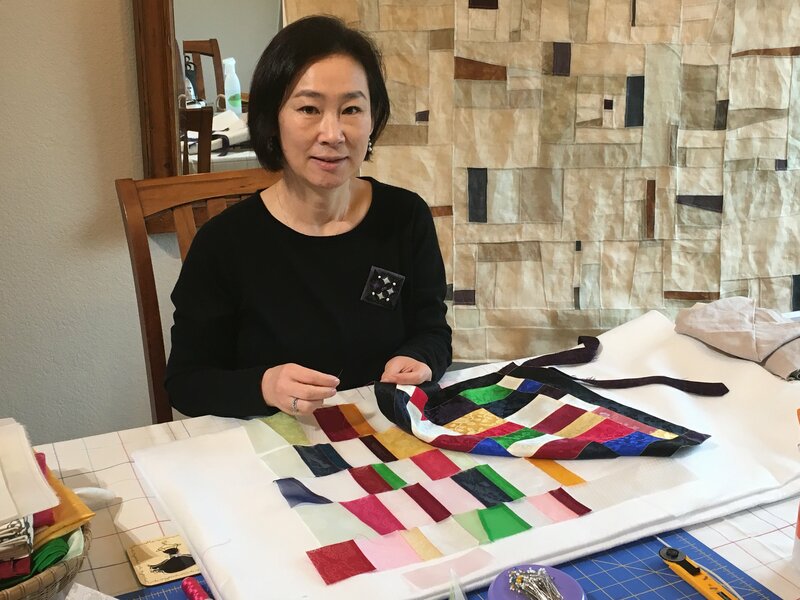 Jogakbo, the art of Korean patchwork wrapping cloths (bojagi), embodies the philosophy of recycling, as the cloths are made from remnants of leftover fabric. It also carries wishes for the well-being and happiness of its recipients. This labor of love and prayers imbued bojagi with a memory of affection. I chose bojagi as my creative medium, and I appreciate the beauty that results from the long and slow process of hand stitching. Bojagi work comforts me as it connects my native culture and my adopted culture. Diane Cutler is a former member of the Redwood Guild who now lives in Cottage Grove, Oregon. She writes: As a child of 10 years, I was taught to knit. As I grew older I knitted as a hobby. After graduating in Cosmetology, raising three boys, and working full time in my salon, knitting took a back seat. After the boys were grown and left the house, I learned to weave. I fell in love with the whole process. Some of my Guild members spun and thought I should also. It has been a wonderful trip and weaving, knitting, spinning and then dyeing has been an adventure still happening. What I will show you is a small part of many wonderful hours. As an artist, I am interested in creating works that add beauty and a sense of quiet to the places they inhabit. Early in my career, I wove one-of-a-kind fabric to use in my line of women’s fashion. This early exploration of color and drape in wearable art, informs my current work in tapestry where I continue to blend yarns of different tone, texture and weight to achieve richness and depth. My tapestries often reflect my inner call for peace and order; though occasionally depict humorous images as a shout-out for comic relief in an all-too-serious world. Some recent work speaks to dramatic events playing out around us. I’ve been told that my work is architectural in feel; the weight, line and balance reflecting an architect’s sensibility. Feeling that often less is more, my designs are intentionally spare, exploring rhythm and asymmetry in bold compositions. Weaving attracts me for its simplicity: two opposing sets of threads twining together to create a whole. Working at the loom provides me the opportunity to sit in the stillness of my thoughts, allowing my hands to think. Long time TTAG member, Dotti Day, will share her experience and research in Eco printing and dyeing. Eco printing can be used with paper and various fabrics. Silk and wool are the most receptive to color but cotton and linen can also be used. Dotti will demonstrate the various processes and the group will be able to experiment with the techniques of bundling and wrapping. She will bring several steamed items ready to unwrap so members can see the surprises of the results. Members who attended the November TTAG retreat are asked to bring samples of their projects. Their materials and examples will be discussed. If other members have tried this technique, please bring your items to share.